2 c. fresh blueberries, rinsed and dried. Mix together in a small bowl. Set aside. Preheat oven to 375^. In a medium bowl, combine four, baking powder, and salt. In a large bowl, using an electric mixer, beat butter and sugar until light and fluffy. Add eggs, one at a time, beating well after each addition. Add dry ingredients alternately with milk and vanilla and mix until batter is smooth. Gently fold in blueberries with a spatula. Spoon batter into sprayed muffin tins, filling about three-fourths full. Sprinkle the top with cinnamon and sugar mixture. Bake until toothpick inserted in the center comes out clean, 25 - 30 minutes. Remove from pan and cool on a rack. Serve warm. 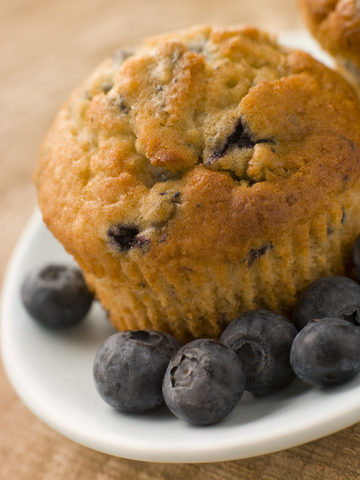 Fresh berries add a spring time touch to muffins this time of year. This blueberry muffin is one that I found many years ago and have received many compliments on its rich buttery flavor. I love to serve fruit everyday in every way. I am sure that is due to growing up with a fruit orchard. Gluten-free breakfasts are being requested more and more by our bed and breakfast guests. At the Avenue Hotel B&B we make ever effort to accommodate the eating needs of our guest. Use 12 medium muffin cups (grease if not using paper cups). Add the liquid ingredients to the dry ingredients. Stir only until combined. Batter will be lumpy. Adding 1/2 cup of raisins is an option that makes this recipe even more nutritious. Fill muffin cups two thirds full. Slightly more for paper cups. Bake for 20 minutes. 1. Position a rack in the center of the oven and preheat the oven to 350°F. Generously butter the bottom and sides of a 13 x 9-inch baking dish. 2. Place the oats, flour, flaxseeds, baking soda, baking powder, cinnamon, and salt in a medium-size mixing bowl and stir to combine. 3. In a large bowl, whisk together the brown sugar and the oil. Add the eggs, one at a time, beating well after each addition. Stir in the buttermilk. 4. Add the oat mixture to the buttermilk mixture, and stir to combine. Add the carrots and apples, and stir just until blended. Transfer the batter to the prepared baking dish. 5. Place the walnuts, coconut, brown sugar, and cinnamon in a small bowl. Stir to blend, and sprinkle the topping mixture evenly over the batter.